Massachusetts House of Representatives leadership recently reappointed state Rep. Ken Gordon, D-Bedford, as vice chairman of the Joint Committee on Election Laws. Last session, more than 80 bills were referred to the committee, which is tasked with investigating the legislative and policy ramifications of all proposals covering voter registration, early voting, campaign finance, regulations relative polling places and other election related topics. “It is an honor to be reappointed to such an important committee for our democracy, both local and national. Last year Massachusetts saw record turnout at the polls and the introduction of statewide early voting I am interested to hear more from stakeholders on what we can do to ensure that all qualifying residents are registering to vote and accessing the polls,” said Gordon. In addition to his leadership role on the Joint Committee on Election Laws, Gordon was also reappointed to the Joint Committee on Transportation. The committee considers development, operation, regulation and control of transportation in the commonwealth, including on land, sea and air. “One of the most important issues in our district is the overflow of traffic from I-95 and U.S. Route 3 onto our local roads. Working with the Department of Transportation and learning about their needs last session allowed me to explore more options that could alleviate traffic in our towns,” said Gordon. Gordon was also newly appointed to the Joint Committee on Community Development and Small Businesses and the House Committee on Bonding, Capital Expenditures and State Assets. These committees oversee legislation regarding economic districts and local planning commissions and all matters relating to the commonwealth’s giving, loaning or pledging credit. The work of both of these committees creates economic development across the commonwealth. “When it comes down to it, the most exciting aspect of the upcoming session is the opportunity I will have to work on the issues that most directly impact our communities. I am grateful to the voters for electing me to this position and to leadership for appointing me to these committees; I am looking forward to getting to work,” said Gordon. Public committee hearings, during which the public has an opportunity to testify on behalf of legislation filed, will begin in the coming weeks. From there, committees assess the proposed legislation and vote on sending it further through the legislative process. 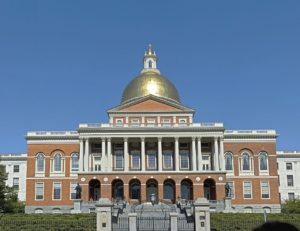 Ending an exhaustive first month of the legislative session, state Rep. Ken Gordon, D-Bedford, introduced 19 bills and co-sponsored dozens more as Beacon Hill buckles down to an important new session. Among the bills filed by Gordon is legislation that will shield ratepayers from unwarranted gas pipeline expansion costs by preventing utilities companies from passing the costs of building or expanding gas pipelines onto consumers in the form of fees. The Supreme Judicial Court ruled in 2016 that this practice is illegal and the legislation would codify the ruling. Gordon filed bills designed to assist the local economy by attracting high-tech employers and businesses that come with them to the new “Middlesex 3 Corridor.” Joining with state Sen. Ken Donnelly, D-Arlington, whose district includes Burlington, he filed several bills that will expand workforce training opportunities for mid-career workers. Gordon revised and re-filed his bill calling for a paid family and medical leave program for all Massachusetts workers. This bill would allow workers in Massachusetts to take job-protected paid leave to recover from a serious illness or injury, to care for a seriously ill or injured family member, or to care for a new child. The bill would allow for an employer to the money that may have been used to pay the worker on leave to hire a temporary replacement worker or to provide additional hours to a part-time workers. Gordon traveled to Washington several occasions to work with the federal government and other state legislators to work on the policy. Gordon also filed a bill that is aimed at the prevention of sexual abuse of students in schools and minors served by state agencies, by raising the age of consent in these situations to 19. For veterans, Gordon joined with local advocate Marie Ardito in filing a bill that allows Veterans in public service to use up to four years of active duty service towards pension benefits. In defense of civil liberties, Gordon filed a bill backed by the ACLU to prevent potential employers and schools from asking applicants for social media passwords as a condition of employment or involvement in school activities. His cosponsored platform supports initiatives to improve public education at all levels, to encourage good government practices, to enhance elder services, to mitigate raising healthcare costs, to protect civil liberties and to reform the criminal justice system. Once the bills have been assigned to committees, they will each be put before a public hearing. Anyone interested in testifying on behalf of a bill may contact Gordon at Kenneth.Gordon@mahouse.gov.